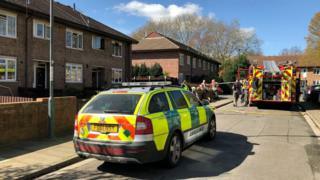 A woman in her 70s has died after a fire at a house in Derby. Derbyshire Fire and Rescue Service said they were called to a house on Mundy Street at about 10:40 GMT on Monday. A man is currently in hospital being treated for his injuries, although they are not thought to be serious. The fire service said an investigation has been launched with Derbyshire Police to establish the cause of the fire, which is believed to have started in a bedroom. BBC reporter Andrew Strachan said the top two windows of the house are black from smoke damage. Firefighters managed to stop the blaze from spreading to neighbouring houses. "Our thoughts and sympathy go out to the family and friends of the deceased," a fire service statement said.